Tom Thibodeau's Bulls almost never make a mistake — but will that be enough? Plus: The Big Australian returns and Caron Butler punks a Raptor. The Bulls have been the league’s best defensive team since Chicago hired Tom Thibodeau before the 2011 season. But they’ve achieved that in a sort of counterintuitive way. The NBA is a pick-and-roll league, and you can feel Thibodeau’s stress building when he starts talking about facing “50 or 60 or 70” pick-and-rolls in the same game, “and with so many variations.” The pick-and-roll is a two-man play, generally involving a ball handler and a big guy setting a screen for that ball handler. Chicago has built its defense around an interesting principle: It wants one of the two guys directly involved in the pick-and-roll shooting at the end of it. Scary news for the rest of the league: The Bulls are pretty close. Watch film of Chicago’s defense until your eyes bleed/your wife kills you — and I did — and the precision, so close to perfection, is overwhelming and almost beautiful. The Bulls, more than any team I’ve ever seen — including the Duncan-era Spurs and the 2007-08 Celtics, for whom Thibodeau was the defensive coordinator — just do not make mistakes. Even Carlos Boozer, justifiably maligned for his flat-flooted defense,2 at least understands Chicago’s scheme and places those flat feet in the right place at the right time. He doesn’t misread plays, botch rotations, stand up lazy and straight, or gamble irresponsibly, and is thus not actively harmful in the way someone like Monta Ellis or DeMarcus Cousins can be to a team’s defense. Chicago is up to third in points allowed per possession despite dealing with a new wave of injuries and working in a bunch of new parts, including a totally revamped bench. They’re struggling on offense and have some rotation questions to answer, but that defense, so damn good, is the reason the Bulls stand 10 games over .500, a sleeping giant of a title contender awaiting the return of the one player who can make its ho-hum offense go. • Their point guard, Kirk Hinrich or Nate Robinson, will jump in front of the pick and try to force the ball handler away from the screen and to the left side. I don’t have access to the fancy statistical databases that could verify this,3 but I’d bet heavy that Chicago is one of the two or three best teams at getting opposing point guards to go left. Hinrich might be a non-entity on offense and one of the most boring players in the league, but he is willing to engage in physical battles to get between a point guard and a pick. “He has always been very, very difficult to screen,” says Gar Forman, the Bulls’ GM. 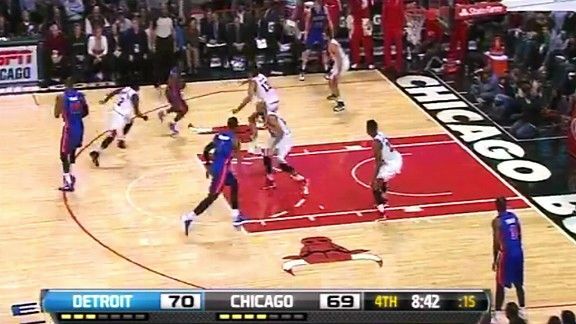 A bonus: By positioning himself between the opposing ball handler and screener at the start of a play, Hinrich stays in or near the passing lane between them as the play develops and each moves toward the rim. Chicago opponents have trouble hitting roll men near the basket because any such pass has to go through a thicket of arms; a startlingly high percentage of shots roll men actually attempt against the Bulls are long 2-point jumpers — the worst shot in the game. 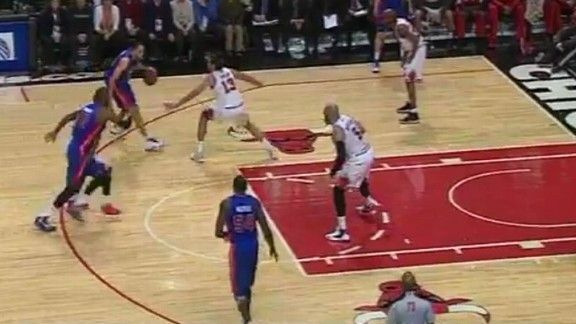 • The big man guarding the screener (Joakim Noah, Taj Gibson, Boozer) will drop down around the left elbow, hoping to corral the ball handler there. The goal is to force the guard to pick up his dribble so that the big-man defender can return to the big man rolling to the rim. • The three Chicago defenders guarding the shooters around the perimeter generally stay close to home rather than crashing hard into the paint. This is where the Bulls differentiate themselves from lots of other teams, including Miami and Boston. If a pick-and-roll goes left, it is generally the job of the defender guarding a shooter on the right side of the floor — the weak side at that point — to dash into the paint and bump the big man rolling toward the hoop. This is why you often see such defenders stationed with one foot in the paint, far from their actual “man,” before a pick-and-roll even starts. Chicago is generally opposed to this style of help, maniacally so when that weak-side shooter is a 3-point ace. “We don’t want to overcommit and open ourselves up to a kick-out pass for a corner 3,” Thibodeau says. And holy cow, are they successful. Chicago is on pace to allow the fewest corner-3 attempts per game for the third straight season, and it isn’t even close. Only two teams have allowed a lower shooting percentage on corner 3s this season, and none outdid Chicago in this regard in either 2010-11 or 2011-12. The degree to which the Bulls execute Thibodeau’s wishes is scary. Chicago is also probably the best team in the league at stunting — that is, having a wing defender fake aggressive help in the middle of the floor with no intention of actually staying there. Watch below as Jimmy Butler, Chicago’s newest basketball crush, slides in from the weak side just long enough to complicate Jeff Teague’s thought process for a beat. Butler never comes to a full stop in the paint and veers right back to Korver in the right corner, staying in the passing lane the whole time. Teague scores here, but the defense is basically perfect. Robinson forces Teague to go left, away from the pick, and Gibson bottles Teague up at the foul line. 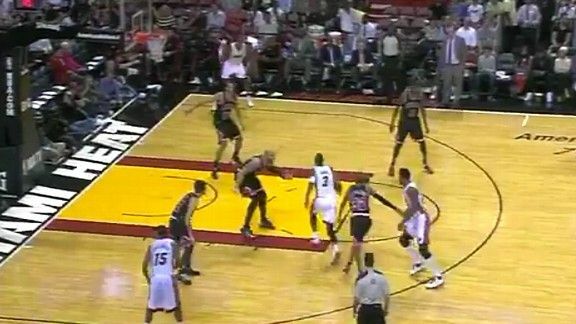 Teague crosses over to the middle, but Butler’s stunt stops him there without yielding a passing lane to Korver. Teague is left with the dreaded midrange 2. He makes it, but this is a win for Chicago, and they’ll work to get it again on the other 90 possessions of torture the Hawks have to navigate. Chicago is the best in the league at this sort of moving half-help. The whole team is a testament to what can happen when the right players meet the right coach. Chicago employs three of the league’s best defenders in Noah, Deng, and Gibson, with Butler a budding multi-positional stopper off the bench. The rest of the players are more limited defensively, but they follow the rules all the time. They know the game plan, the opponent’s game plan, and the opposing personnel, in part because Thibodeau drills and re-drills all that stuff during famously detailed shootarounds and practices. More than one player has compared Thibodeau to the famously perfectionist Stan Van Gundy, with one difference: No one on the Bulls, and especially not the stars, has grown tired of Thibodeau’s style. It would be hard to draw up a better realistic opponent shot selection chart than the Bulls pull off. Only four teams allow fewer attempts in the restricted area, and only two — the Pacers and Spurs — allow more from the low-efficiency midrange area between the restricted area and the 3-point arc. It’s a rare thing. Look out to Sacramento, where the Kings have a coach in Keith Smart who could talk unprompted to a stranger for two hours about a proper defensive stance. And yet the Kings are dead last in points allowed per possession, a sieve of a team that never gets any better despite Smart’s endless detail-oriented cajoling. Either Smart doesn’t have the ability to really reach his players, or they don’t have the ability and/or willingness to execute what he’s teaching — or some combination thereof. Smart’s story in Sacramento is more common than Thibodeau’s in Chicago. But let’s not build the Bulls up into world-beaters, for this season or the next few. Intelligent teams with the right personnel might be able to find holes in that stout D,4 and on the other end, Chicago ranks just 19th in points per possession. They have struggled badly offensively without Rose after growing into a top-10 offense last season before his injury. They rely on a handful of predictable sets involving coordinated motion on both sides of the floor — motion designed to get the defense moving and allow Chicago’s skilled big-man passers to find seams in the defense below the foul line. It has worked well enough to win a bunch of regular-season games, but the Bulls will need something more if they face an elite team in the postseason. Their current rotation might not have it. Five of Chicago’s eight most-used lineups have a negative point differential for the season, and those that have outscored the opposition mostly feature Nate Robinson — a player Thibodeau may not trust for huge minutes in slow-paced, defense-first games.5 Chicago has been outscored overall with the Boozer-Noah duo on the floor, and though it’s tempting to blame some of that on those two sharing heavy minutes with Hinrich, the same holds when you swap Robinson into Hinrich’s place. The Gibson-Noah duo has worked better, and the Gibson-Noah-Robinson trio has been especially good on both sides of the ball, per NBA.com. It will be interesting to see how Thibodeau balances the rotation when Rose returns to add some pick-and-roll spice to Chicago’s offense. One reason for hope in the case of a showdown against Miami: Butler’s emergence could make Chicago a more dangerous small-ball team in stretches, and Gibson is an especially key anti-Heat ingredient regardless of whether Chicago chooses to play big or small. Gibson is even better than Noah at switching onto wing players on the perimeter; Forman settled on Gibson as a worthy first-round choice after watching him defend James Harden on switches during the Pac-10 tournament, he says. Gibson’s quick feet give Chicago the ability to stay big, with two traditional power players on the floor, against smaller teams such as Miami and New York. Thibodeau prefers it that way, he says, since the Bulls can punish those teams on the glass. Chicago, with Rose healthy, is a very dangerous playoff team. Still: The front office did not have to choose this route. Rose’s injury and uncertain return date gave the Bulls a one-season out to address their long-term cap picture in the way the Grizzlies just did in the Rudy Gay deal — by trading one of their high-priced pieces for cheaper assets, regaining some flexibility in the process. Chicago is over the luxury tax now and is on pace to be over again next season; they aren’t slated to have cap room until after the 2014-15 campaign, when Boozer’s deal finally expires. And that theoretical cap room won’t exist if the Bulls re-sign Deng after the 2013-14 season. Finding a workable Gay-style deal is hard. Rose is untouchable, and Noah is nearly so. Boozer is radioactive. Gibson will be expensive next season, but he’ll still only make about half of what these other guys do, and league rules make him very tricky to trade now. That would leave Deng as the asset Chicago realistically could have dealt this season in order to clean up the cap sheet. That would be painful. Deng is a tad overpaid, but he’s very good, and he’s central to Chicago’s identity. And Chicago has spent so much already that slicing away Deng’s deal wouldn’t take them under the cap until the expiration of Boozer’s contract anyway. I pointed out that the Bulls already have something like $59 million committed the season after that summer Forman cites, meaning they’d have no cap room as of now. “Situations are fluid,” Forman says. He won’t elaborate, and he won’t address the possibility of using the amnesty provision on Boozer to make that cap room a reality. But that move or an unexpected trade stand as the only means through which Chicago could acquire meaningful cap room before July 2015. For now? Let’s cross our fingers for Rose and marvel about what an NBA team can do when committed, as a group, to defense and rebounding. The Bulls might not have enough time to craft a title contender this season, but they’re a nightmare to play against, and they’ll make anyone — up to and including the Heat — earn every needed point in four playoff wins. It’s important to be cautious. Bogut is on a minutes limit, and we have to see how his ankle holds up. His free throw stroke still looks funky, and he’s not getting there much so far. He’s sagging further into the paint when defending pick-and-rolls than is probably recommended. But if all goes well, the Warriors are about to become the league’s most enjoyable watch. 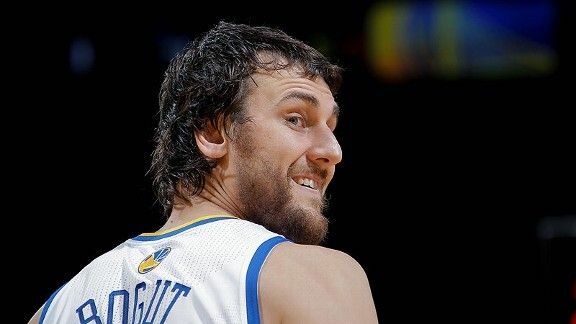 Bogut fits the rest of the roster perfectly. His passing skills are as sharp as ever; he’s facilitating from the elbow now and then, and he and David Lee already have a delightful tic-tac-toe chemistry on high-lows and pick-and-roll plays. Bogut is challenging everything at the rim, piling up those oh-so-Boguty rejections that occur almost literally at the rim and travel to a teammate’s hand instead of 10 rows into the stands. I love this play: Shawn Marion will hold the ball at the left elbow while O.J. Mayo comes rumbling around a two-man Dirk–Big Man X screen on the right side. It looks like a run-of-the-mill NBA action designed to free Mayo for a catch-and-shoot jumper, right until Mayo abruptly stops his cut, turns back toward the hoop, and squeezes between the two big men who just screened for him. As the defense is digesting that bit of surprise, Big Man X (often Elton Brand) will turn and set a new pindown screen for Nowitzki, who can cut around that screen for the same catch-and-shoot chance that appeared to be Mayo’s just seconds ago. Good stuff. I’ve already harped on this, but I’m going to keep doing so until the league cleans it up. Erik Spoelstra, a fantastic coach and also the league’s worst offender in this regard, nearly tripped an official Sunday in Toronto after stepping a full two strides onto the floor to yell out some advice ahead of a defensive possession. I’d remark on how rare this sort of interference is during game play, except I can think of a half-dozen examples, without researching at all, of coaches impacting play because they can’t stay on the damn sideline. The rule is simple: Officials are to call a technical anytime a coach steps onto the floor without permission. Start blowing the whistle, and the coaches will adjust in a week. Smith is a very good all-around player, but if he really wants a max deal, he has to ditch his tendency to stand straight up under the rim instead of boxing out an opposing player. Luol Deng victimized Smith several times Saturday by simply veering around Smith’s non-boxouts, and Alonzo Gee won a late November game by skirting around a stationary Smith for a buzzer-beating putback. Smith’s defensive rebounding numbers have sunk this season after two solid rebounding campaigns, and he has to develop better rebounding habits now so they are in place when he ages — and he can’t rely on his athleticism anymore. I don’t even know. On the one hand, this is clearly rude and probably unsportsmanlike, since it makes Valanciunas look like a fool. On the other, the Clippers were down by 27 when this happened, so it’s not as if they were rubbing in a victory. And I’ve written before how most of these unwritten rules are silly, and that pros should expect to play hard for 48 minutes, even when a game is in hand. Also: You have to be kind of insane to do what Butler did here, and on-court insanity without violence is generally entertaining. Basically: I’m confused and have no baseline from which to work here. The Kings have Cousins doing more of this now, especially from the left elbow, and this is where the differences between Cousins and a guy like Bogut shine through. I get the idea of placing Cousins here, since he’s a skilled passer, and this setup can get Tyreke Evans some looks off duck-ins and cuts. But giving Cousins the ball as a creator from 15 feet out also exacerbates his worst habits — chucking jumpers and seeking a highlight-reel pass when a simple one will do. Another cool play. It starts with a Brooklyn wing (say, Keith Bogans) entering the ball to Deron Williams on the right block as a Nets big man (often Reggie Evans) stands near the entry passer on the right side of the floor. Evans and Bogans will then trot over to the left side of the floor, as if they are just clearing the way for Williams to post up. But they’ll suddenly shoot up toward Lopez, who has been standing at the left elbow the whole time. Bogans and Evans will form a two-man screen, allowing Lopez to cut around that wall, catch a pass from Williams near the foul line, and launch one of his little push shots. Luc Richard Mbah a Moute is a weird player. He doesn’t have a clear position, and he might “play” a different one on offense that he does on defense during particular stretches. He can’t shoot, so he cramps a team’s spacing if he plays with two other big guys. But with Bogut gone, Mbah a Moute is posting up a lot more, a skill that fills a void when he’s on the floor with Ersan Ilyasova (a shooter) and LARRY SANDERS! And he’s doing it pretty well. The Fresh Prince is 18-of-35 on post-up tries this season after attempting just 15 such shots all of last season, and he’s drawing a ton of fouls on the block, per Synergy Sports. He’s also a nifty interior passer who can squeeze the ball through tight spaces. The downside of that passing has been a bunch of turnovers, but the good outweighs the bad so far. A little thing to watch. Drummond has done a ton of nice things so far, but shooting 37 percent from the line constitutes a crisis. He’s well below the mark at which it becomes sound strategy for defenses to hack him whenever Detroit has the ball, and teams will start doing that unless he improves. Players tend to get better at the line as they age, so let’s hope Drummond reaches the point where defenses at least have to think about how to treat him. 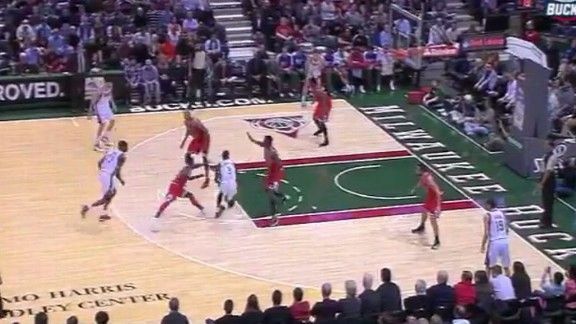 For instance: The Bulls treat pick-and-rolls on the side of the floor a bit differently than those that start up high and in the middle. The 15 teams who have invested in the SportVU camera/tracking system do, but they hold that data secret. Teams with mobile bigs who can slip screens could have some success penetrating the defense by having point guards deliver quick passes near the foul line early on pick-and-rolls. David West, Tyson Chandler, and Chris Bosh, among others, all come to mind. Quick-hitting pick-and-rolls on the side of the floor that come after the ball swings from one side to the other are always good, especially if teams can run them with two wing players in the pick-and-roll — thus taking Noah and Gibson out of the two-man group defending the main action. I can think of two perimeter guys in Miami who run a pretty mean pick-and-roll, and two more in Oklahoma City.